Are you interested in raising morale? Raising income? Creating excitement in your programs? Boosting attendance and retention? Here are tried-and-true methods to make your gym one of the happiest places ever! These two DVDs features games and fun activities for warm-up, conditioning, skill development and more, with choices for all age groups. Disk 1 will focus on General Use activities that can be used for any situation. Disk 2 features advanced activities that can be used to spice up conditioning, develop skills and have a ton of fun doing it! It includes lots of group activities and skill-specific ideas. 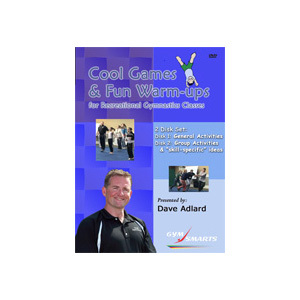 Dave Adlard is a long time coach who has taught clinics and congresses around the world. He also runs some of the most successful events in the country. For years he ran the Region 2 congress for the pacific northwest. Dave and his wife Lisa have a gym in Coeur d Alene, Idaho where they have a very fun, exciting and successful program.